Good news for fornicators! “Christian” Left pastor says it is only a sin if you were “called” to celibacy. Isn’t that convenient? If you aren’t “called” to obey God’s commands then they are optional. And better yet, guess who decides what that vague “calling” really is and whether or not you’ve received it? You do! This just keeps getting better for sinners. Of course that’s the “good news” the average person wants to hear: Just keep sinning! No need to change! And the “Christian” Left preaches that all day, every day — even as they are claiming that you can’t understand anything clearly in the Bible (because apparently the Holy Spirit wasn’t involved . . .). 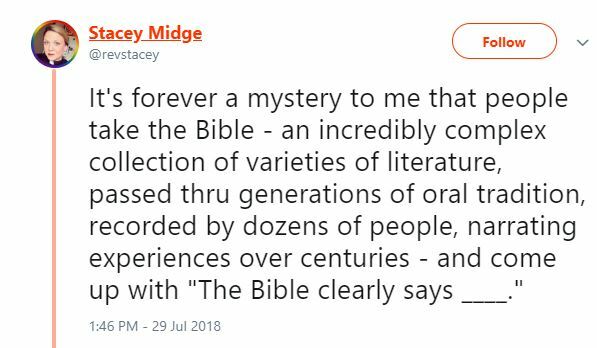 Of course she couldn’t answer the simplest questions about this, such as how she knows that about God or whether she tells her congregation each week how she is just making stuff up (because the Bible isn’t clear enough for her to interpret it for you). She also couldn’t provide examples of where she tries to silence “Christian” Leftists who think the Bible is plenty clear when justifying abortion to the child’s 1st breath, or advocating for socialism, open borders, LGBTQX perversions, etc. I used to feel sorry for people in “Christian” Left churches, but anyone follow this lady obviously loves the world more than God. Run, don’t walk, from the “Christian” Left. Repent and believe in the true Jesus.